COLORADO SPRINGS – Aisha (pronunciation: Eye-Shuh) Ahmad-Post, who produced The New York Public Library’s flagship cultural series, is the new director of the new $70 million UCCS Ent Center for the Arts. 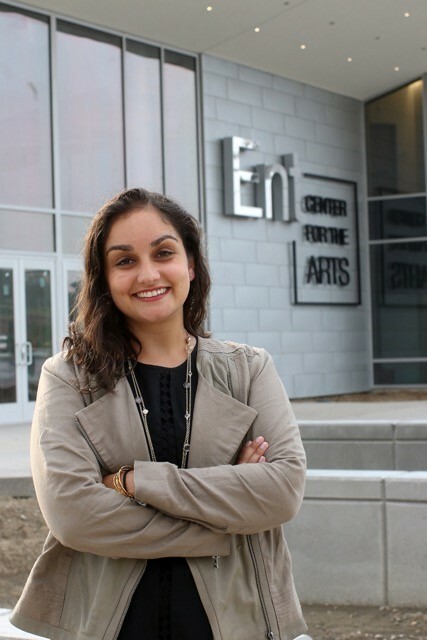 Ahmad-Post was selected following a national search and will be responsible for programming the Ent Center for the Arts’ performing arts series and representing the 92,000 square-foot arts complex to the community. The Ent Center for the Arts opens in January 2018. Drew Martorella, executive director, UCCS Presents, announced Ahmad-Post’s appointment. The Ent Center for the Arts will be the new home for the university’s existing professional arts organizations, Theatreworks and the UCCS Galleries of Contemporary Art, as well as the Department of Visual and Performing Arts’ Music Program and Theatre and Dance Program. The Ent Center will contain four performing arts venues, a visual arts gallery, rehearsal studios, classrooms, practice rooms, and a café. While there are multiple performing arts venues in the Ent Center for the Arts, Ahmad-Post will focus on programming the 780-seat Shockley-Zalabak Theater and the Chapman Foundations Recital Hall. The first series of performances in the Ent Center for the Arts will begin in February 2018. UCCS Presents supports arts, culture, and community for UCCS and the Pikes Peak region through its programs that included the University Center and Event Services, UCCS Galleries of Contemporary Arts, Theatreworks, and a new dance and music series which will debut at the Ent Center for the Arts in February 2018. The Ent Center for the Arts is a 92,000 square-foot performing and visual arts complex at UCCS. It will provide a multi-dimensional, multi-venue artistic hub for UCCS and the region.